As it stands, Abominable is the single best sasquatch movie ever made. This is the one to beat. It’s no small feat (no small feet!? Hilarious! ), either, many quality films have come before, be they your family friendly Harry and the Hendersons, your spine tingling speculative documentaries like Legend of Boggy Creek, or your crowd pleasing horror romps like Shriek of the Mutilated or Night of the Demon, but of all these, Abominable is the one ring to rule them all. How can this be? Well, the first key to Abominable’s success is that it has gore and naked people. Even with glorious titan of entertainment John Lithgow slam dunking that mother like a champ, Harry And The Hendersons simply cannot compete with Abominable in this regard. Secondly, Abominable rips off Alfred Hitchcock’s classic film Rear Window with apparently no remorse of any kind. The plot is damn near identical, a wheel chair bound man witnesses something terrible and tries frantically to warn those around him, but his claims are dismissed and thus he must race against time to prove himself before it’s too late. Now, in Rear Window we had Jimmy Stewart trying to convince people that Raymond Burr had murdered his wife. 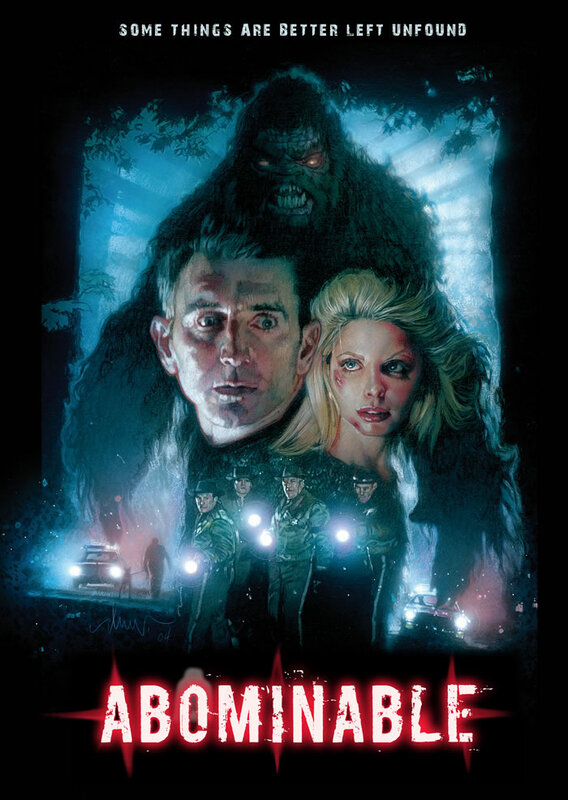 In Abominable, we have Police Academy 5: Assignment: Miami Beach star Matt McCoy trying to convince a house full of college girls that a Sasquatch is trying to eat them. Knowing that director Ryan Schifrin must have watched Rear Window and recognized the potential of remaking the film with the inclusion of a sasquatch and a house full of college girls is pretty awesome. In Hitchcock’s defense, there was virtually no way for him to have known how desperately Rear Window needed a Bigfoot type monster in it, no matter how glaringly apparent it is to us today. You see, Rear Window was released in 1954, a full four years before the term “bigfoot” was coined in 1958, and a full 13 years before the Patterson Film raised sasquatch public awareness and made him a household name. In other words, at the time of Rear Window’s release, Alfred Hitchcock may not have even known what a sasquatch was. Doubtless, he knew his film was missing some crucial component, though, and when he did see the Patterson footage years later there is no question in my mind that he was immediately hit with the realization that this is what his film so badly needed. I’m sure this shortcoming haunted him for the rest of his days, but happily we can now see that his suffering is at an end, because Ryan Schifrin has succeeded where Alfred Hitchcock could not, he has brought us the movie we’ve needed without knowing for over 50 years. Now we can all sleep easy knowing that future generations will never again have to settle for the inferior bigfootless 1954 version, now we have Abominable. Finally we are able to enjoy Hitchcock’s vision as it was always meant to be seen; a Sasquatch stomping about violently, the screams of young women echoing through the forest in utter futility as they are one by one dismembered for no apparent reason at all, and all of this transpiring before the wide, horrified eyes of Matt McCoy, himself nearly powerless to bring this bloody rampage to an end. Rarely can we see examples of films which bring this much wanted closure to our pained, desperate zeitgeist, but Abominable is that one special film out of a million. I mean, no disrespect to Jimmy Stewart, he’s one of my favorite actors ever, but go watch Jaws without the shark and let me know what you thought of it. Also, the sasquatch in this movie kinda looks like Luis Guzmán, which is clearly also a plus.